Houses and heavy items are individually priced. 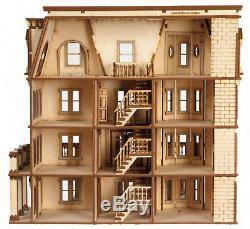 Melody Jane Dolls House Hegeler Carus Mansion 1:48 Scale Laser Cut Flat Pack Kit. 1:48 Scale - Flat Pack Kit - Made from unfinished hardwood birch 1/4 inches in U. 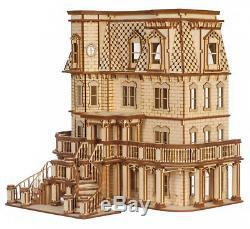 Easily assembled - Many detailed features This is a replica of the Hegeler Carus mansion in LaSalle Illinois. It is a Historic Landmark and a wonderful part of American history. The house is a complete kit with working interior doors, main entry door, side exterior door, all shingles are pre-cut for fitting the roof, plexiglas, frames, stairs and rails. House measures 13 inches Wide 11 inches Deep with porch stairs and 11.1/2 inches High = 33cm x 28cm x 29.2cm Main stairs, interior stairs, doors, and roof windows come preassembled for quick assembly. Kit comes unassembled and unpainted. Adult collectors item not suitable for children under 14. SKU: LD427 / Barcode: 8800159424571. Brand: Laser Dollhouse Designs Inc. Our products are not playthings and are not meant for children under the age of 14 years. These items are intended for adults to use in the construction and accessorising of dolls houses and similar projects. Over 4,500 Stocked Items With items added every day, you're bound to find what you need! We've got you covered! 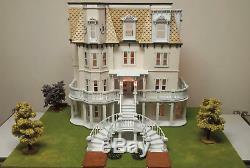 The item "Melody Jane Dolls House Hegeler Carus Mansion 148 Scale Laser Cut Flat Pack Kit" is in sale since Thursday, October 18, 2018. This item is in the category "Dolls & Bears\Dolls' Miniatures & Houses\Dolls' Houses".